The four major ethnic divisions among Black South Africans are the Nguni, Sotho, Shangaan-Tsonga and Venda. The Nguni represent nearly two thirds of South Africa’s Black population and can be divided into four distinct groups; the Northern and Central Nguni (the Zulu-speaking peoples), the Southern Nguni (the Xhosa-speaking peoples), the Swazi people from Swaziland and adjacent areas and the Ndebele people of the Northern Province and Mpumalanga. Archaeological evidence shows that the Bantu-speaking groups that were the ancestors of the Nguni migrated down from East Africa as early as the eleventh century (see general history timeline). The isiNdebele language, of which there are variations, is part of the Nguni language group. IsiNdebele is one of the 11 official languages recognized by the South African Constitution, and in 2006 it was determined that just under 600 000 South Africans speak isiNdebele as a home language. Similar to the country's other African languages; isiNdebele is a tonal language, governed by the noun which dominates the sentence. The Northern Transvaal Ndebele (now Limpopo Province) around the towns of Mokopane (Potgietersrus) and Polokwane (Pietersburg). The Ndebele people of Zimbabwe, who were called the Matabele by the British. The two South African Ndebele groups were not only separated geographically, but also differed in their language and cultural practices. The Ndebele of the Northern Province consisted mainly of the BagaLanga and the BagaSeleka groups who were influenced by their Sotho neighbours, and adopted much of their language and culture. 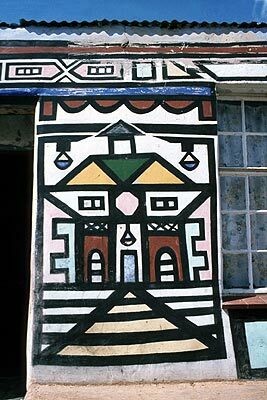 The famous house-painting, beadwork and ornamentation often spoken of as Ndebele are produced mostly by the Ndzundza Ndebele of Mpumalanga and Gauteng (Southern Ndebele). This group speaks a variation of isiNdebele that is considered a ‘purer’ form of the language, and is closely related to the Zulu language. This version is the only written form of the language. Strongly patriarchal attitudes and practices are evident in Ndebele communities. Perhaps more than many other groups, Ndzundza men – especially those of chiefly background – continue to practice polygamy. Women must practice ukuhlonipha (respect) towards their husbands and parents-in-law in particular, but also towards men in general. Making and selling beadwork, mats, dolls and other crafts have thus provided some Ndebele women with an independent livelihood. These include internationally famous women like Esther Mahlangu – who has been commissioned to paint her designs on BMWs and South African Airways jets - and those with humbler aspirations. Rites of passage or initiation ceremonies are practiced among the Ndebele; Ukuwela is a male initiation that marks the passage from childhood to adult status. Through the process of initiation, young boys are inducted into traditional lore and the deep mysteries of the group. This knowledge is passed on from one generation of initiates to the next, ensuring that the transfer of knowledge is maintained. One of the occasions on which isikhethu is enunciated through beaded and decorative clothing is iqhude (girl's initiation), which occurs at puberty. At a wedding, female participants also dress in elaborate ceremonial clothing. Here, the bride and her female relatives and attendants are dressed in beaded aprons and necklaces. For both these rituals, the financial provision for a young woman's finery is made by a male relative. These colourful clothes also bear vivid testimony to the distinctiveness of Ndebele culture within the broader world of inter-ethnic politics. Ndebele people have always managed to retain their cultural practices. More recently, women in Ndzundza society have come to be thought of as the custodians of isikhethu (lit. "that which is ours") which consists of the relationships, beliefs and practices on which the very essence of Ndebele identity is centred. Alongside the care of ageing in-laws, and the socialisation of and inculcation of values in children, this role includes the manner in which women clothe their bodies in various ceremonial contexts. Some Ndebele people converted to Christianity under colonialism and missionary influence. However, although there are many Christian converts, ancestral beliefs have not disappeared. Instead, there has been a mixture of traditional beliefs and Christianity. Ancestral spirits are important in Ndebele religious life, and offerings and sacrifices are made to the ancestors for protection, good health, and happiness. Ancestral spirits come back to the world in the form of dreams, illnesses, and sometimes snakes. The Ndebele also believe in the use of magic. Ill fortune such as bad luck and illness is considered to be sent by an angry spirit. When this happens, the help of a traditional healer is sought, and he or she will communicate with the ancestors, or use natural herbs and prayers to get rid of the problem. Most Ndebele trace their ancestry to the area that is now called KwaZulu-Natal. The history of the Ndebele people can be traced back to Mafana, their first identifiable chief. Mafana’s son and successor, Mhlanga, had a son named Musi who, in the early 1600’s, decided to move away from his family (later to become the mighty Zulu nation) and to settle in the hills of Gauteng near Pretoria. After Chief Musi’s death, his eldest son, Manala was named future chief. This was challenged by another senior son, Ndzundza and the group was divided by the resulting squabble between the two. Ndundza was defeated and put to flight. He and his followers headed eastwards, settling in the upper part of the Steelport River basin at a place called KwaSimkhulu, near present-day Belfast, leaving Manala to be made chief of his father’s domain. Two further factions, led by other sons, then broke away from the Ndebele core. The Kekana moved northwards and settled in the region of present-day Zebediela, and the other section, under Dlomo, returned to the east coast from where the Ndebele had originally come. By the middle of the 19th century, the Kekana had further divided into smaller splinter groups, which spread out across the hills, valleys and plains surrounding present-day Mokopane (Potgietersrus), Zebediela and Polokwane (Pietersburg). These groups were progressively absorbed into the numerically superior and more dominant surrounding Sotho groups, undergoing considerable cultural and social change. By contrast, the descendants of Manala and Ndzundza maintained a more recognisably distinctive cultural identity, and retained a language which was closer to the Nguni spoken by their coastal forebears (and to present-day isiZulu). Hence, the formation of the Southern vs. Northern Ndebele. A third group, subjects of the Zulu leader Mzilikazi, fled north from Natal after his defeat by Shaka in 1817. Details of their incorporation into the South African Ndebele groups are confusing and under-researched, but it appears that Mzilikazi settled with a Ndebele group for a period before being defeated by the Voortrekkers in 1836. At this point he trekked over the Limpopo River to present day Zimbabwe, and settled in an area between the Limpopo and the Zambezi Rivers that later became known as Matabeleland. He is therefore credited as being the founder of the Ndebele in Zimbabwe. By the 1820s, Nzundza homesteads were widely dispersed along the Steelport River. This scatter of homesteads was due in part to raids by Mzilikazi and his followers (mentioned above), but also to factional conflict after the death of Chief Magodongo. From the 1840s, white farmers (Boers), who had been migrating to the Highveld in growing numbers since the 1830s, encroached on the areas occupied by the Ndzundza Ndebele. Boer settlements, established between the Olifants and Steelport rivers, were threatened by the proximity of the chiefly stronghold of Konomtjharhelo, established by the Ndzundza Chief Mabhoko I. In 1883, during the reign of the Mabhoko, war broke out between the Ndzundza and the (Boer) Zuid-Afrikaansche Republiek (South African Republic). For eight months, the Ndebele held out against the onslaught by hiding in subterranean tunnels in their mountain stronghold at Konomtjharhelo near the town of Roossenekal. From time to time, Mabhoko’s brave warriors crept past the enemy lines undetected to fetch water and food. However, after two women of the tribe were ambushed in the nearby woods and tortured, one revealed the Mabhoko’s whereabouts. After the Mabhoko’s defeat, the cohesive tribal structure was broken up, and the tribal lands confiscated. Despite the disintegration of the tribe, the Ndebele retained their cultural unity. After 1877, with the British annexation of the Transvaal and the 1879 defeat of the Pedi by the British, the balance of power shifted away from African independent kingdoms in the region. In the autumn of 1883, war broke out between the Boers and the Ndzundza under Nyabela. A strategy of siege and attrition was staged by the Boers under Commandant Pier Joubert. For eight months, Nyabela, with those Ndzundza who had left their dispersed settlements along the Steelport to group around him, were besieged at Konomtjharhelo. A Boer myth has it that they were hidden in a centralized fortress of interlocking caverns, but recent evidence suggests that the well-armed Ndzundza were dug into a series of fortified settlements which spread over a much wider area. The destruction of Ndebele crops and the seizing of their cattle were largely the undoing of the chiefdom, whose people were gradually starved into submission. In July Nyabela surrendered and left his capital for the last time, as the victorious Boers torched it behind him. The conditions imposed by the victors onto the vanquished were very harsh. Nyabela and other members of the chiefly family were imprisoned, Ndzundza lands were confiscated and given to the Boers who had participated in the siege, and members of the polity were given to Boers as indentured farm labourers and servants. Nduzundza were thus scattered widely over the southern regions of the Transvaal Republic, including the districts of Lydenburg, Middeburg, Standerton and Wakkerstroom. Later, under apartheid, many Ndebele living in the northern Transvaal were assigned to the predominantly seSotho-speaking homeland of Lebowa, which consisted of several segments of land scattered across the northern Transvaal. Others, mostly southern Ndebele, who had retained more traditional elements of their culture and language, were assigned to KwaNdebele. KwaNdebele had been carved out of land that had been given to the son of Nyabela, a well-known Ndebele fighter in Kruger's time. The homeland was, therefore, prized by Ndebele traditionalists, who pressed for KwaNdebele independence through the 1980s. KwaNdebele was declared a "self-governing" territory in 1981. However, very few of its 300,000 residents could find jobs in the homeland, so many inhabitants worked in the industrial region of Pretoria and Johannesburg. At least 500,000 Ndebele people lived in urban centres throughout South Africa and in homelands other than KwaNdebele through the 1980s. During the 1980s and the early 1990s, many Ndebele recognized a royal family, the Mahlangu family, and the capital of KwaNdebele was called KwaMhlanga. The royal family was divided, however, over economic issues and the question of "independence" for the homeland. These disputes were overridden by the dissolution of the homelands in 1994. At that time, in addition to the estimated 800,000 Ndebele people in South Africa, nearly 1.7 million Ndebele lived in Zimbabwe (Matabele), where they constituted about one-sixth of the population, and another 300,000 lived in Botswana. In September 1854, 28 Boers were killed in what would later become the Northern Transvaal. These Boers were killed in three separate incidents by an alliance of the Ndebele chiefdoms of Mokopane and Mankopane. In anticipation of a military retaliation that he knew would come, Mokopane and his followers retreated into some caves. In late October two Boer commandos and their Kgatla allies attacked the caves, but failed to take them or force the people out. The commandos laid siege to the caves. It was against such raids and encroachment on their lands and resources by the Boers that the incident had occurred. According to most accounts, including oral traditions, these attacks had been intended to chase the Boers away from Ndebele lands. The material for this box, including the quote, is from Isabel Hofmeyr, “We Spend Our Years as a Tale that is Told”: Oral Historical Narrative in a South African Chiefdom. Johannesburg, Witwatersrand University Press, 1993, especially pp.109-111.